Who are you PKS 0625-354? The extragalactic sky seen at very high energy energies (VHE, E ≥ 100 GeV) in gamma-rays includes about 70 sources, the largest fraction of which are blazars. 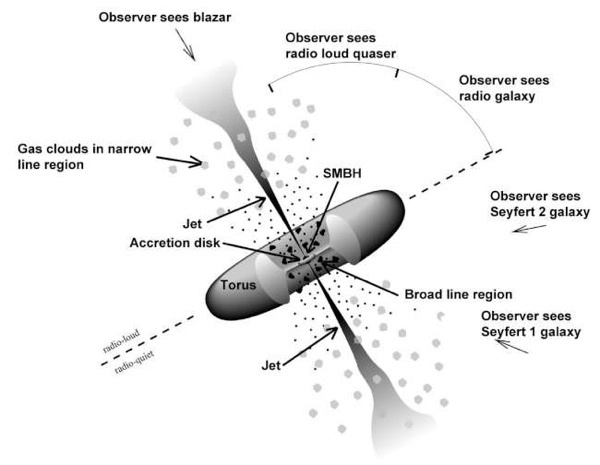 In the unification model of Active Galactic Nuclei (AGN), blazars are radio-loud sources whose jet axis points towards the observer's line-of-sight. This orientation results in significant Doppler brightening of the source for observers looking into the jet cone, an effect that plays a significant role in the broadband emission observed from these sources. Except for blazars in the catalog of TeV detected gamma-ray sources ), there are also a few extragalactic sources that belong to the class of radio galaxies (or misaligned blazars). These are namely, NGC 1275, M87, Centaurus A and 3C 264. Since these are objects that are seen from Earth at viewing angles outside of the jet cone, the Doppler brightening effect is almost entirely lost. 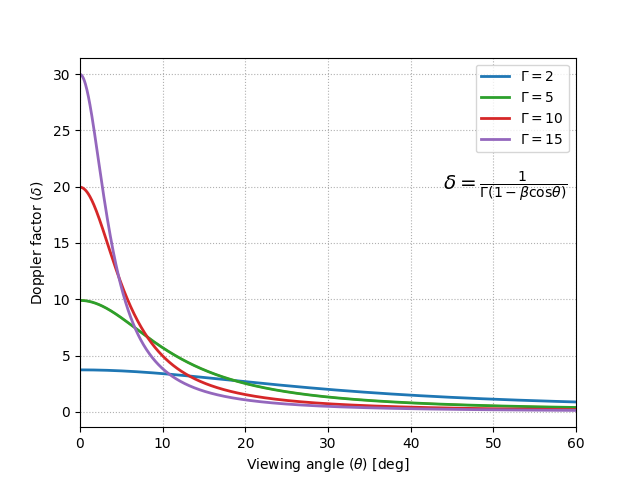 How values of Doppler factors δ change with respect to the viewing angle θ (for a given Lorentz factor Γ) is presented in Figure 1). The Lorentz factor is connected with the relativistic speed of the plasma in the jet (β = v/c) as follows: Γ = (1-β2)-1/2 . The plot clearly shows that Doppler boosting is significant only for small viewing angles, which are common for blazars. Fig. 1: Doppler factor (δ) as a function of viewing angles (θ) for different values of Lorentz factor (Γ). The relation linking δ and θ is presented in the right, bottom corner of the figure. For blazars δ&gg;1, while in the case of radio galaxies δ<1. Both blazars and radio galaxies, ie. generally all AGN, harbor in their centers a super-massive black hole, with a mass of between a million to a billion times the mass of the Sun. The accretion of matter onto the black hole leads to the creation of an accretion disk surrounding the black hole. For many AGN, a subsequent outflow of material, in the form of a pair of relativistic jets, is formed perpendicular to the plane of the disk. A schematic view of an AGN is presented in Figure 2). Fig. 2: Unified model of Active Galactic Nuclei. Figure taken from . Blazars and radio galaxies are known for their broadband non-thermal emission, observed from radio energies up to high and very high energy gamma-ray ranges. These observations reveal these sources to be effective particle accelerators. In the case of PKS 0625-354, the discovery of the very highest energy photons observed from this object, by H.E.S.S. (High Energy Stereoscopic System), was achieved thanks to the data collected in November and December 2012, during only 5.5 hrs of observations. Along with the observations made by H.E.S.S., PKS 0625-354 was also observed by other observatories in other energy bands, such as by ATOM in the optical band, Swift-UVOT in the ultraviolet band, and Swift-XRT in the X-ray band. At higher energies, Fermi-LAT also observed the source at high energy (HE) gamma ray energies, as part of its regular monitoring program. Multi-wavelength light curves presenting observational data exhibits variability in the emission of PKS 0625-354 only in HE gamma rays and X rays (see Figure 3). There is no indication for changes in its brightness in H.E.S.S. data. Fig. 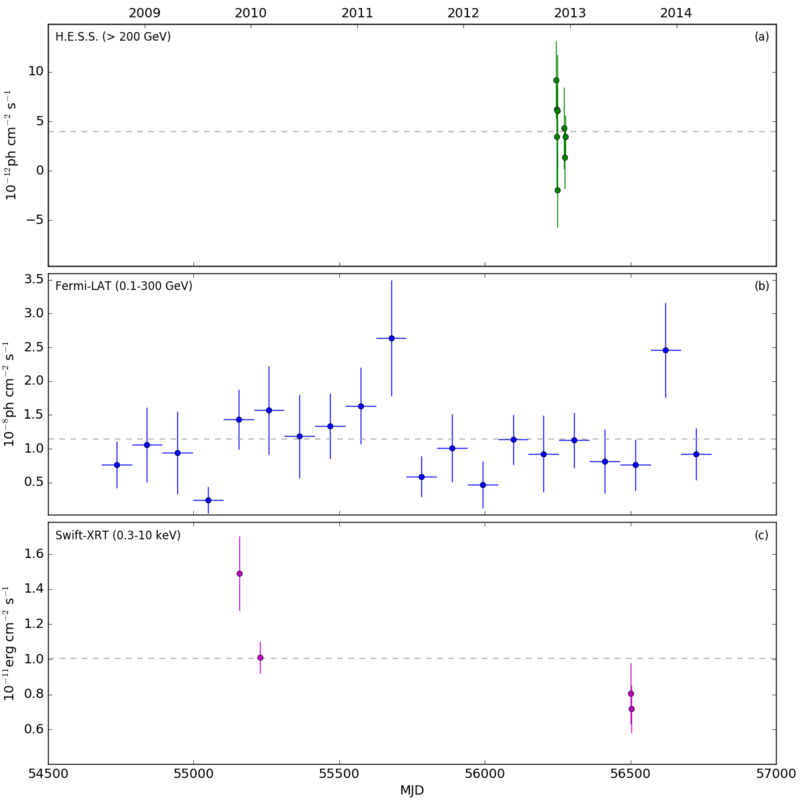 3: Multi-wavelength light curve of PKS 0625-354. Panels from top to bottom present: H.E.S.S. flux above 200 GeV given in night-wise bins; the Fermi-LAT flux in the energy range of 0.1-300 GeV, each point represents about 120 days of monitoring; Swift-XRT flux for the energy range of 0.3-10 keV binned in one-day intervals. Several works introduce PKS 0625-354 as a radio galaxy (ie. an AGN observed at an angle outside of the jet cone). A radio image of this source, presenting data collected with TANAMI is shown in Figure 4. Fig. 4: TANAMI image of PKS 0625-354 at 8 GHz. Contours are logarithmic, separated by a factor 2, with the lowest level set to the 3σ-noise-level. Figure taken from . First, the distance of this AGN, located at a redshift of z=0.055 (ie. 700 million light-years away) makes it very distant for a non-beamed emitter. Indeed, comparing this to other radio galaxies and misaligned blazars detected in VHE gamma rays e.g. NGC 1275 (z=0.017, 220 million light-years away) or 3C 264 (z=0.0217, 300 million light-years away), PKS 0625-354 sits considerably further away. To power the brightness of the source at such a distance, if it is un-beamed, would require a considerably higher luminosity than that of other the radio galaxies detected. Second, Wills et al. (2004)  suggested a blazar-like nature of the object according to spectroscopic optical observations. The authors have shown that the nuclei of BL Lac type objects and FR I radio-galaxies differ, and can be used to discriminate the nature according to the intensity of their [OIII] emission line. The [OIII] luminosity of the BL Lac objects was found to be significantly higher than that of radio galaxies. According to these studies, measurements of the [OIII] emission line from PKS 0625-354 suggests it should be classified as a blazar. Thirdly, the models used to reproduce the broadband SED, and especially the VHE spectrum needed significant Doppler boosting of the emission, associated to relatively small viewing angles. With the X-ray observations and the shortest variability time estimated as 41 days, this angle can be constrained to be smaller than 15 degrees. It is also worth noting here that with further more continuous temporal coverage, more detailed observations of this source will allow variability time scales to be probed to much smaller values, which could potentially imply even smaller viewing angles than the present upper limit. Taking into account these aspects of PKS 0625-354, the classification of this source is not clear, and the core of PKS 0625-354 is most likely blazar-like. So, who are you PKS 0625-354? Radio galaxy? Blazar? Mixture of both? Completely new class of source? 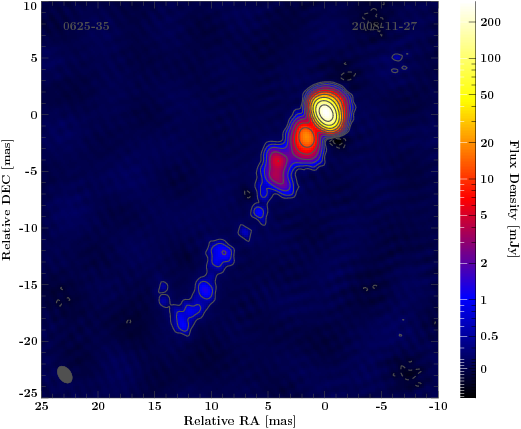 Further details on the detection of the VHE gamma ray emission from the region of PKS 0625-354 and multi-wavelength observations can be found in the paper entitled "H.E.S.S. discovery of very high energy γ-ray emission from PKS 0625-354" .